Corner basins, dual sinks, marble finishes, granite basins, bath tubs, power showers, tiling, mosaics – the choices can feel endless when it comes to the designing a new bathroom for your home. The design elements of remodelling a bathroom are exciting, but it’s essential that we remember to design in long-term practical maintenance, too. A lack of access means simple plumbing problems escalate because no one can get to the pipework. Water will corrode even the best-fitted bathroom pipework over time. Often, plumbers have no alternative but to take off tiling or break through elegant stonework in order to reach valves, pipes and the source of leaks or blockages, which can be heartbreaking for householders. If you’re thinking of installing a new bathroom, Which? 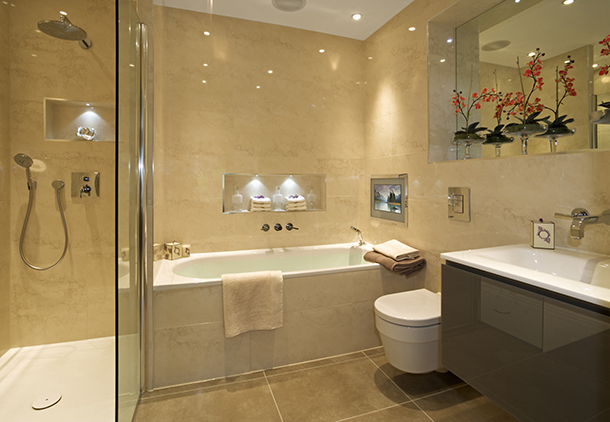 Trusted Traders has endorsed bathroom-fitting specialists in your area. Make sure they factor in future maintenance, by following our advice. Remember water needs gravity to flow – you can’t locate new fittings uphill (even slightly) from existing locations, without completely redesigning the pipework. Soften the water in hard-water areas – your system will last longer if it’s possible to fit a water-softening system to the main pipe brining water into the house. This will reduce limescale build-up in all your pipework and valves. Keep your paperwork – when a bathroom is finally installed and sealed, ensure that the fitters supply you with all the warranties for the fixtures and fittings. Some individual parts, such as valves and taps, will have warranties for five years or more. Even if a part is not under warranty, it will be much easier to source a replacement if you still have the paperwork with the original manufacturer and serial number to show your plumber. The Which? guide to bathroom ideas has advice on design and planning your ideal bathroom from floor to ceiling. 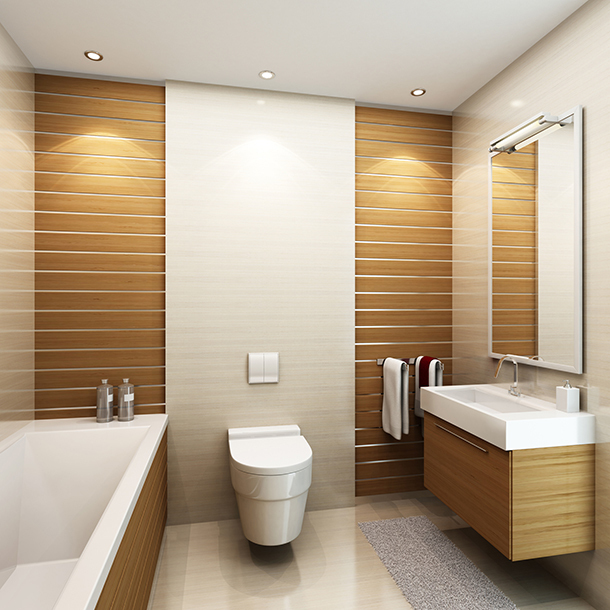 Read on for more specific tips about fitting your fixtures in your bathroom. Baths – the fascia on the bath panel can be tiled, but it must be removable. Tiny mirror screws on the fascia will allow it to be removed. Exafill bath fillers – instead of regular taps on the bath, some designers opt for exafill bath fillers, where it looks like the water fills the bath from the overflow. Typically the controls will be on the wall, rather than the bath itself. These controls need to be on the service side, where a plumber can reach them, rather than behind the wall on the far side, which would involve removing the entire bath to maintain them. Showers – a lot of installations involve concealing the shower fittings by removing the original wall and covering it with concrete. The problem with concrete is that it contains lime and other acidic materials that will attack plastic and copper pipework. Ché Richard recommends situating a shower in an interior wall putt together with timber and plaster-board (a stud wall), with an access panel below the shower so it’s easy to access isolation valves and turn the water off, in the event of a leak. Check the Which? Best Buy electric showers to find out which are the top-scoring models. Concealed toilet fittings – ‘floating’ toilet pans, where the base and cistern are hidden behind panelling, are another fashion that can cause maintenance problems. Again, the fascia (front of the panelling) should be removable for maintenance purposes, and also to ensure that the pans are fitted correctly. If it’s not possible to easily remove the fascia, a bathroom fitter will have to install the pan by pushing it into place without being able to see whether the flush pipe (that carries water from the cistern to the pan) is still in the right place. A slight misalignment can lead to a drip every time the toilet flushes. Over time, water dripping is extremely corrosive – the problem is often identified when you see staining on the ceiling below the drip, by which time there is a lot of damage done, joists may be rotten and you have damp issues, too. Wet rooms - ‘The idea of wet rooms comes from the continent, where properties are more often built with concrete and board, rather than timber and brick. Our housing doesn’t lend itself to wet rooms,’ says Ché Richard. He recommends choosing a specialist installer, particularly one that will offer a long warranty on the installation. A business offering a five-year warranty(or longer) will future-proof your installation to some degree. This should ensure that they look carefully at the design of your wet room, its future maintenance and how it works with your property. If you’d like advice on bathroom fitting and maintenance, Which? Trusted Traders has endorsed plumbers in your area.